When you run an amazing company that is making the world a better place, one of the last things you probably want to hear is that an employee feels harassed or discriminated against. But, statistics show that harassment and discrimination occur at very high rates, and good companies are not immune. After the #MeToo Movement many business owners with scaling companies worry they might lose good employees or even face lawsuits because of discrimination, but they’re not ready to hire a full Human Resources Department. In this presentation, Meredith Holley describes the three steps that work to stop and prevent toxic work environments including: · How to actively diagnose whether a work environment is toxic or healthy; · How to make sure you find out right away if a serious problem exists without spending all of your time listening to complaints; · How to effectively respond to employee issues without losing good employees; · Why investigations alone are not enough to respond to complaints at work; and · Why understanding and navigating the power dynamics of the work environment are key skills for every employee to learn in order to stop and prevent toxic work environments. If workplace cultural problems feel like a test you didn't know you signed up for, this presentation gets you started creating cultural health in your company. 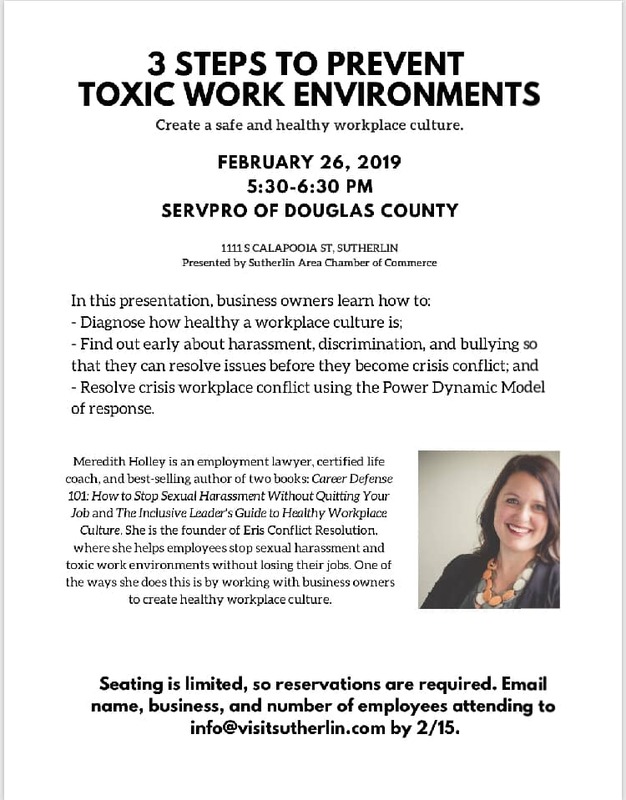 This workshop is available to Chamber members only. Seating is limited and reservations are required before February 15. To register, please email your name, business name and number of employees attending at info@visitsutherlin.com.